You'll explore the less-touristy side of things at Nuuksio National Park and Bellevue Beach. And it doesn't end there: take an in-depth tour of Seurasaari Island and Open-Air Museum, expand your understanding of the military at Sea Fortress Suomenlinna, pause for some serene contemplation at Helsinki Cathedral, and admire the masterpieces at Kansallisgalleria. To see traveler tips, where to stay, other places to visit, and tourist information, you can read our Helsinki online day trip planner . Kathmandu, Nepal to Helsinki is an approximately 12.5-hour flight. You can also do a combination of bus and flight; or do a combination of car and flight. The time zone difference moving from Nepal Time to Eastern European Time is minus 3 hours. Plan for slightly colder temperatures traveling from Kathmandu in August, with highs in Helsinki at 24°C and lows at 13°C. Wrap up your sightseeing on the 11th (Sun) early enough to take a train to Tampere. On the 12th (Mon), enjoy the sand and surf at Riihiniemen Uimaranta, then look for all kinds of wild species at Hatanpaa Arboretum, and then take in panoramic vistas at Pyynikki Park and Observation Tower. On the 13th (Tue), you'll have a packed day of sightseeing: soothe aching muscles at some of the top local wellness centers, then see the interesting displays at Vapriikin Museokeskus, and then kick back and relax at Rauhaniemi Beach. To see photos, more things to do, other places to visit, and more tourist information, refer to the Tampere road trip planner . Take a train from Helsinki to Tampere in 2 hours. Alternatively, you can drive; or fly. August in Tampere sees daily highs of 23°C and lows of 11°C at night. Finish your sightseeing early on the 13th (Tue) to allow enough time to travel to Pyhatunturi. Start off your visit on the 14th (Wed): explore the wealth of natural beauty at Pyha-Luosto National Park. Get ready for a full day of sightseeing on the 15th (Thu): explore and take pictures at Amethyst Mine Lapland, then identify plant and animal life at Kopara Reindeer Park, and then see exotic creatures in open habitats at a safari tour. To find more things to do, photos, other places to visit, and other tourist information, refer to the Pyhatunturi route site . Use the Route module to find suitable travel options from Tampere to Pyhatunturi. In August, daytime highs in Pyhatunturi are 20°C, while nighttime lows are 9°C. Finish your sightseeing early on the 15th (Thu) so you can travel to Kouvola. Kouvola is a town and municipality in southeastern Finland. Step off the beaten path and head to Arboretum Mustila and Repovesi National Park. Step out of the city life by going to Niivermaki Nature Conservation Area and Hiidenvuori. 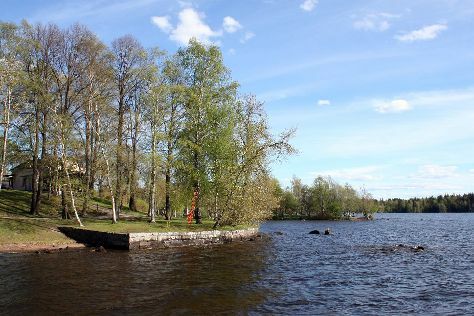 Explore the numerous day-trip ideas around Kouvola: Kotka (Riverside Park, Linden Esplanade, & more). For more things to do, maps, traveler tips, and more tourist information, refer to the Kouvola road trip app . Explore your travel options from Pyhatunturi to Kouvola with the Route module. Plan for a bit warmer nights when traveling from Pyhatunturi in August since evenings lows in Kouvola dip to 13°C. Wrap up your sightseeing on the 18th (Sun) early enough to travel back home.